Sometimes I get conflicting information on the whole "eggs for breakfast" debacle- do we love them or hate them? I'd love for you to comment below & tell me! Anytime I ask for recipe requests or what you'd like to see more of, I immediately get "egg-free breakfast recipes". But every time I do a poll asking whether we love or hate eggs... over 90% of people say "love"! So do you get my confusion!? Either way, I'm all on board for switching it up now & then. And I do know that there are many of you out there who truly dislike eggs or have sensitivities to them, or are even allergic. So here I am with another egg-free breakfast, and I'm honestly loving it! I must say: this has become a fast favorite of ours... and we both LOVE eggs! 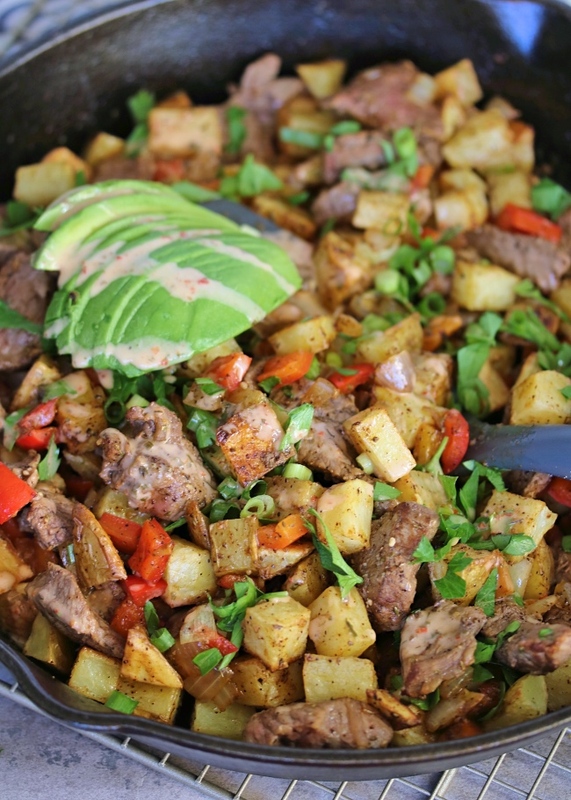 This starts with crispy roasted potatoes that get tossed in with smoky steak and veggies sautéed in ghee with plenty of Southwest spices that I love. One of my favorite parts? Drizzling a little (or a lot) of spicy ranch over top! It takes things up a notch but is SO easy- it's almost cheating. We make a big batch of this and store it in the fridge to eat throughout the week. Heat it up in the microwave if you're at the office or in a pinch, or re-crisp it on the stovetop in a hot skillet with a little avocado oil or ghee. 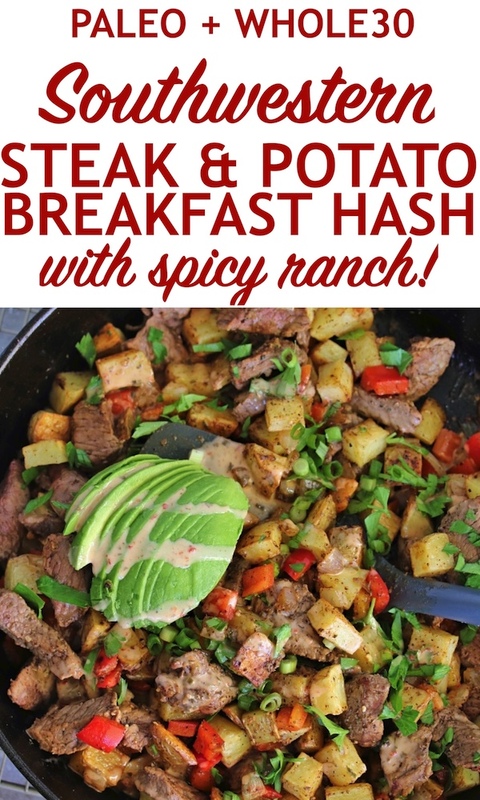 Serve it up with some bacon, avocado, and plenty of that spicy ranch- and you are setting yourself up for an amazing start to the day- that seriously tastes like the best restaurant breakfast! Missing your eggs or looking to switch things up throughout the week? Add a poached, fried, or soft boiled egg over top. You could even do scrambled eggs and mix it all together! So delicious. Looking for "steak tips"? We add some to our ButcherBox every month. A standard size custom box is our go-to for getting all the cuts of meat we need for 30 days, and the steak tips are to die for! They're juicy & tender and so versatile. But you can also sub any cut of steak you like-- just cut it into bite-sized pieces! Hope you enjoy this dish, whether you are an egg person or not. Don't forget to tag me on Instagram @justjessieb if you make it! I'd love to see! Preheat the oven to 400ºF. On a baking sheet, toss the diced potatoes with about 2 Tbsp of cooking fat, and salt & pepper to taste, and lay them out in a single layer. Bake for 20 to 30 minutes, or until golden brown, tossing halfway through. Meanwhile, heat a large skillet over medium. 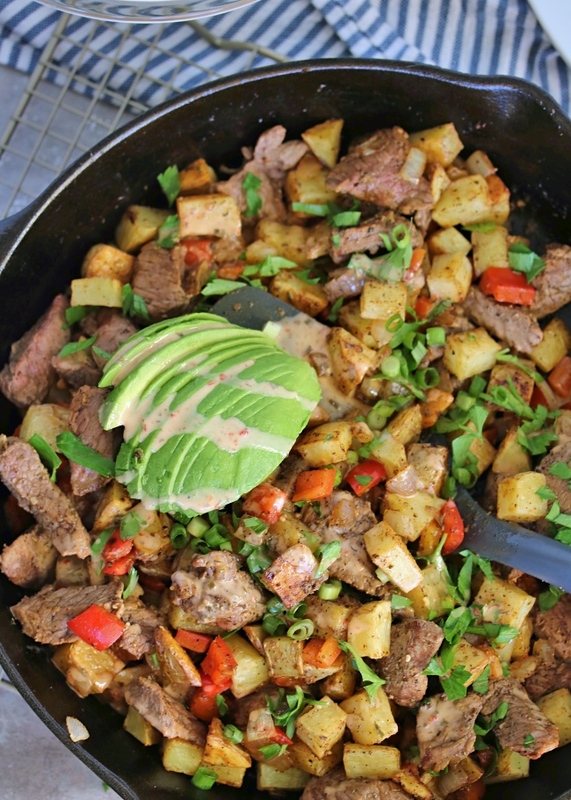 Add 2 Tbsp of cooking fat to the pan, and add the steak tips. Cook for a couple of minutes per side, until browned. Remove the steak from the pan, and set it aside on a plate. Add the bell peppers & onions to the pan, stirring and cooking for about 5 minutes or until soft. Add the garlic and seasonings and stir. Stir in the potatoes and steak, and cook for a couple of minutes until warmed through. In a small bowl, combine the hot sauce and ranch. 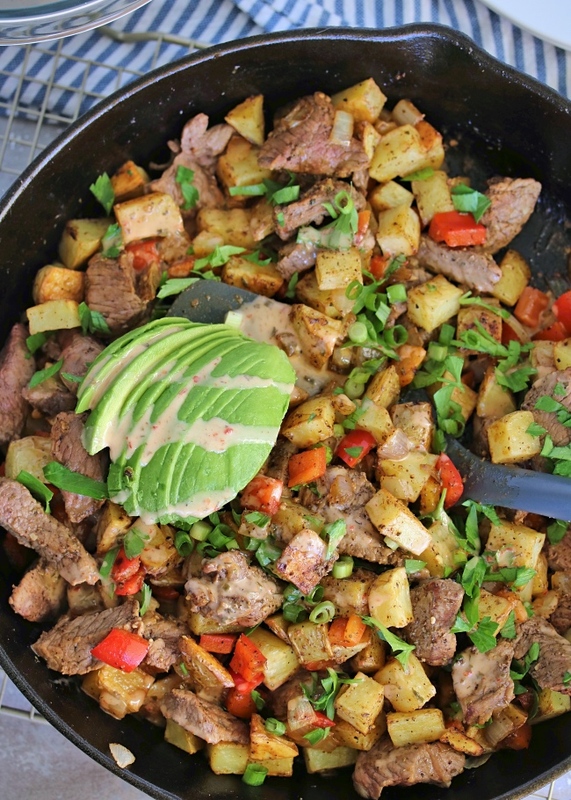 Serve the hash hot with garnish of your choice and a drizzle of spicy ranch. Enjoy! We prep this dish ahead and reheat for breakfast throughout the week. 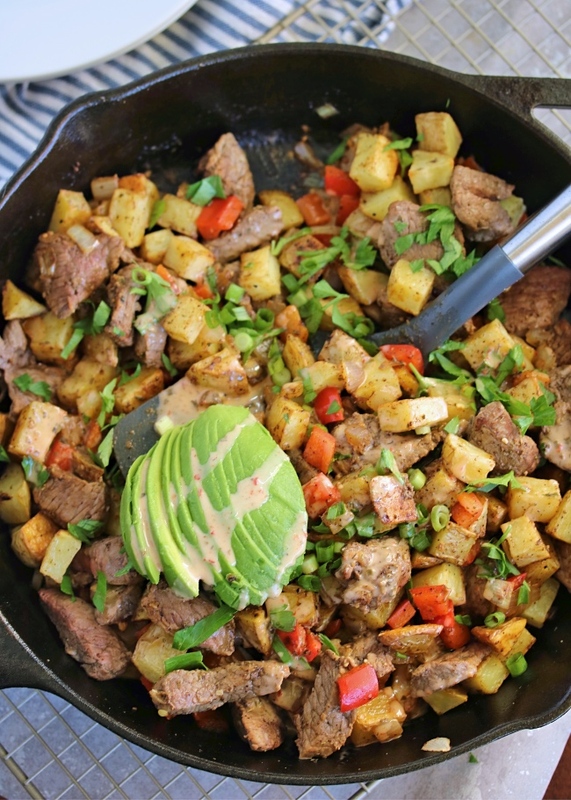 It heats well in the microwave, and is great re-crisped on the stovetop with just a drizzle of avocado oil or ghee! 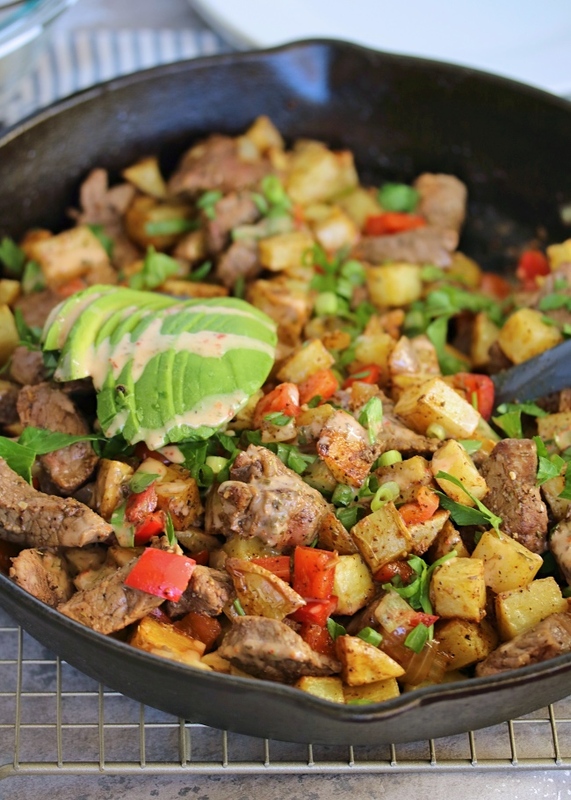 This would also be incredible with leftover carnitas or tri tip! This looks amazing! I am going to make it this week! I am allergic to eggs so I am always looking for egg free and gluten free (celiac disease). I made this today as part of my Whole30 compliant breakfast. And wow! I ended up using Inside Round steaks sliced thin and against the grain. We buy a half cow from a neighbour so we have lots of cuts to choose from (with some being prized and others sorta meh). But the inside rounds worked good enough. Don't use outside round. Way different. Seeing your picture of how small the potatos were helped to copy. They cooked beautifully. And i topped with avacado and your suggested spicy ranch dressing. This is amazing. I ended up making my own "dump ranch dressing" by the Whole Sisters online. Thanks for the recipe. And now onto the next!